One place to start is with Doug Amy. He wrote the last book on my topic, which came out in 2002. I first met Doug at the 2006 APSA meeting in Philadelphia, along with Joseph Zimmerman and Jack Nagel. All are analysts of electoral reform. Jack has an excellent article on Approval Voting. More on Joe below. Doug’s two books on proportional representation picked up where Leon Weaver left off. 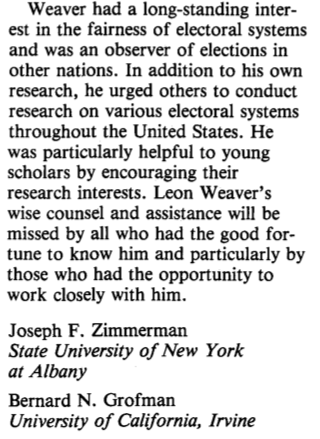 Weaver, who passed in 1991, was a founding member of the APSA Section on Representation and Electoral Systems. Their best-paper award still bears his name. Equally important were Weaver’s efforts to document the history of proportional voting in the United States — what the cool kids now call “ranked-choice voting in multi-member districts.” His empirical work on this issue appeared in two edited volumes: one by Arend Lijphart and Bernard Grofman (1984), then a second by Kathleen Barber (1995). The second, posthumous piece was with Jim Blount, who passed in 2017. When I started my project in 2013, I went to see Doug in Holyoke, Mass. It was our first meeting in seven years. Doug, now an advisor to Voter Choice Massachusetts, eagerly passed on Weaver’s papers. They contain regular correspondence with Ferdinand Hermens, famous for the idea that proportional voting caused Nazi fascism. They also reflect a preoccupation with Cambridge, the sole jurisdiction in this country that did not repeal its quota-based PR method. You’ll see that Zimmerman was a co-author, along with Bernard Grofman. Joe’s role goes a bit deeper. 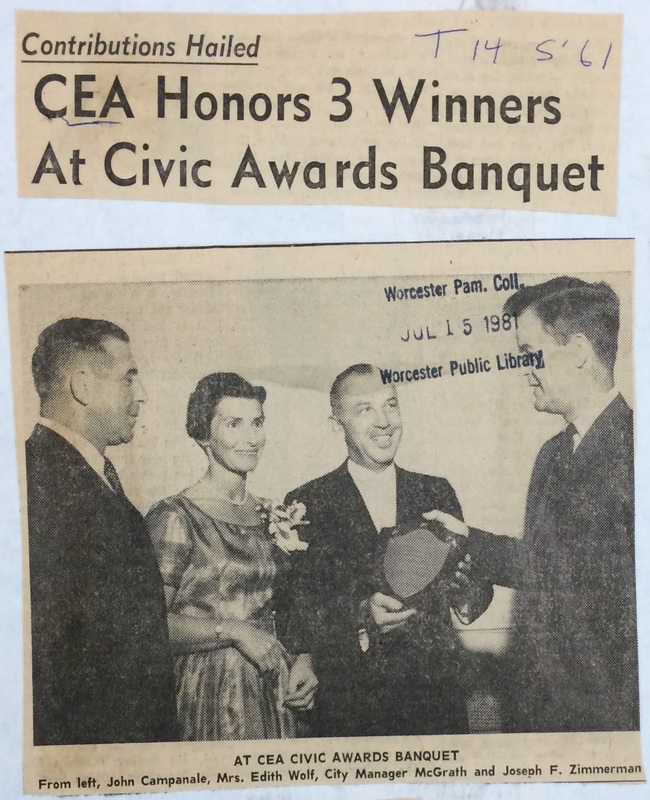 While Professor of Government at Worcester Polytechnic, he also served as president of the Citizens’ Plan E Association from the mid-to-late 1950s. The CEA was a policy group and bipartisan slating organization in that city, during its years with PR voting. 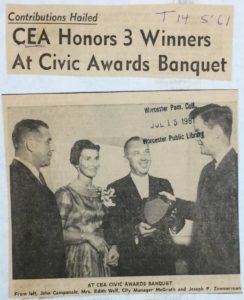 Here he is accepting an award in 1961. The occasion was the city’s receipt of All-America status. Later in the 1960s, but before the Democratic Party had assumed its present civil-rights role, Edward Banfield and James Q. Wilson lamented the diversity that sometimes comes out of a PR election. Their 1963 book City Politics used interviews to make a case against the system. In Worcester, they had claimed, PR enabled Jews and Yankees to dominate the government. Joe published a corrective in The Annals, noting that other groups had won as well, and suggesting that their presence had been consequential. Fast-forward to 1986, when Weaver still was writing. 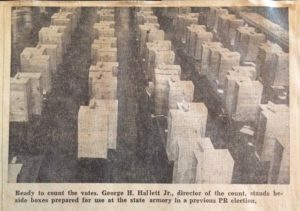 He, Zimmerman, Lijphart, and Grofman wrote an obituary for one George Hervey Hallett, whom we see counting PR ballots in either 1949, 1951, or 1953. Though Hallett was known as “Mr. Proportional Representation,” he held a doctorate in mathematics. In January 1919, on returning from World War I, he became Assistant Executive Secretary of the Proportional Representation League. He joined Field Secretary Walter J. Millard, himself appointed in 1918, after a probationary year. Together with C.G. Hoag, who co-invented the Model City Charter, Hallett and Millard were present for that charter’s spread to 22 cities. One more was its birthplace, and in New York, which was the 24th, Hallett was a co-author of a tailored reform package. Millard left the movement in September 1949, to serve as director of the Public Ownership League. Interesting guy. 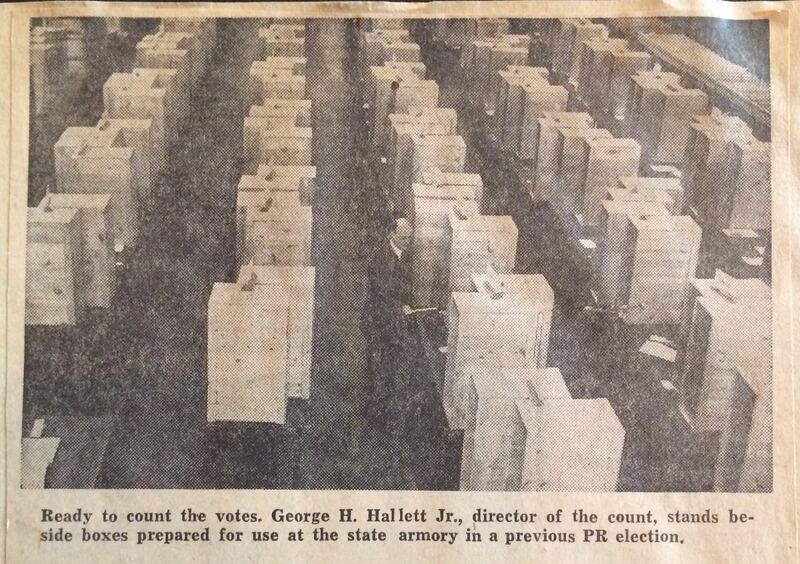 Hallett formally left his post in 1953, but he continued writing and counting PR ballots. He later became active in the Section on Representation and Electoral Systems, whose book award has borne his name since 1989.